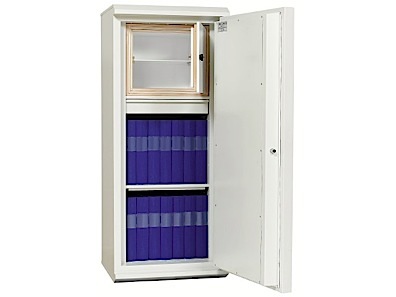 Fire resistance grade document cabinet Fire resistance grade 120P (NT Fire 017). Powder coated in grey-white RAL 9002. Tested and approved according to Nordic standards. 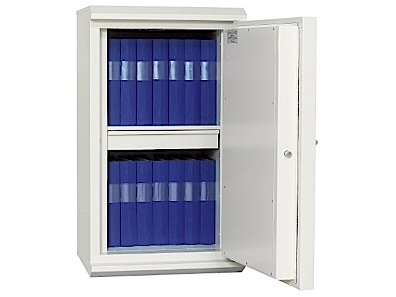 Easy to place cabinets in neutral design for binder storage as standard. 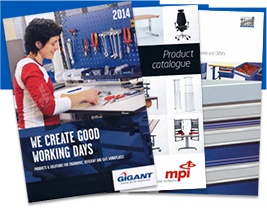 Equipped with adjustable shelves, optional placement every 33 mm, shelf height 10 mm. The cabinets can easily be supplemented with extendable suspension file frames, drawers, etc. Right-hand hung door as standard, left-hand hung at no extra charge. Lock: Phase 6490 with 2 keys. The cabinets can be equipped with other key locks or electronic locks on request.